Review - Righteous Kill: Hey, we expected better, much, much better! A tired, average crime thriller which just about manages to stay alive thanks to its two lead actors. The expectations were high; after all we had arguably two of the greatest actors in the business sharing screen space after more than a decade. (The last time was in Michael Mann’s crime thriller Heat) Robert De Niro and Al Pacino are both in their sixties and are legends, immortal beings who have defined the very contours of acting. They have a substantial body of work to their credit and are to boot superstars. So one has a right to expect the film to be above average if not good. Unfortunately, the film disappoints on all counts. The screenplay tries to be far too clever, but has an extremely weak rationale for the conflict or loss of faith which is at the heart of the plot. The writer throws in a decoy here, a red herring there, all of which are weak, and then tries to make it all jell together in the end. All the decoys make the plot seemingly far more complicated than it is, and distracts the viewer. One starts to suspect the main plot point about 20 minutes into the movie. The director then takes this badly written material and goes in for fast editing and hand held close-ups to create an edgy feel to the story and characters. Things seem to move at a very fast pace; I suspect this was done to avoid the feel of a police procedural thriller. He also chooses a dark predominantly monochromatic colour palette and throws in some grainy, news video type sequences, all for that gritty feel. He has two great actors to work with, but unfortunately they have no memorable lines, neither do they have any standout scenes. Both De Niro and Al Pacino are competent; they could have done these parts while taking out their laundry. We have at times De Niro relapsing into his trademark “braggart” style of declaiming all and sundry, but for the most part his work is low key. Pacino does not go into the jumpy, edgy mode and remains low key too. The final denouement is terribly listless and lacks any energy. 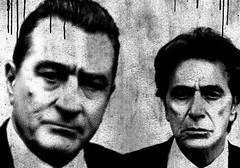 De Niro and Pacino go through the routine and the movie ends. By that time anyways you desperately want it to end. A terrible, terrible disappointment is what the movie is; one really wished that the director and the writer had reviewed their brief before they made this film. Seriously, this one is a terrible waste. Two cops who have worked together for 30 years or more and are thick pals, have to find a serial killer who is bumping off people who seem to have escaped justice. The banter between the two buddies just does not work in the scenes that they have together as the dialogues are very pedestrian. There is also this scene between Pacino and his boss played by Brian Dennehy which is set in a diner where talk is repeatedly drowned out by the passing of the elevated trains. It comes at an important point in the film, in the second half, and could have been a great scene as both are fine actors but it falls flat again because of the dialogues.